Banglarbhumi.gov.in Step-by-Step Process on Banglarbhumi Khatian Plot information, Banglarbhumi Land Records or WB land record, Banglarbhumi RS-LR plot, Land Conversion Application, Land Classification info, Mutation Application, GRN Search, Reprint Application at banglarbhumi.gov.in….. The Land and Reforms Department of West Bengal has made it easy to find documents concerning citizens land online on their http://banglarbhumi.gov.in/. People can easily find Khatian and plot information on that website. This means that you can now check if the property is real and its value through the Banglarbhumi website. People cannot be easily tricked to buy lands that do not exist because all the land details are online. Other services offered by the site include; Banglarbhumi Mutation case status where you get complete information on West Bengal land reform plot information, mutation and rules to be followed. West Bengal Banglarbhumi Khatian Plot property valuation, where you get information on the different costs of land in different areas. Finally, on this website, you will also find the Banglarbhumi Land Records App where you download the app and get to check out land records, plot information, the status of mutation and many more. This website is helping people save time because they do not have to go to the land offices to check on any land information. On the home page, come to the menu column on the top of the screen. Point the mouse on “Citizen Service”. Click on ‘Know your Property’ option, and you will be redirected to another page containing Khatian and plot information. On that page, select your district name, your block name and the name of your Mouza on the provided list. According to your preference, you can either search for the Khatian number or the plot number. 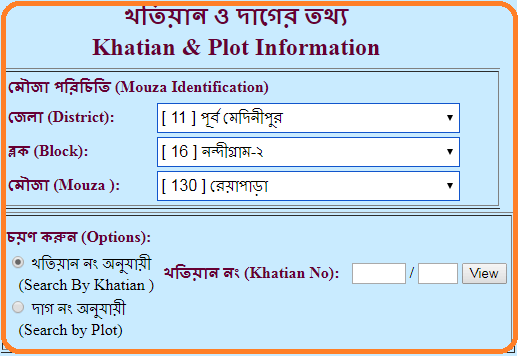 Enter the Khatian or the plot number and click on the ‘submit’ option. You will get all the relevant information about Banglarbhumi Khatian and plot information. Banglarbhumi website has made the whole process easier because everything is done online you don’t have to go the land and reforms department. You can see a lot of tabs on the menu bar – Home, About Us, DLRS, SLUB, Thika Tenancy, Land Acquisition, Acts / Rules / G.O, Citizen Services, Training, LRTT, Admin. One of the tabs is of Citizen Services. Just move your cursor on Citizen Services tab. There you can see another submenu where you have to click on RS-LR plot information. When the RS-LR Plot Information page loads it will show you fields like District, Block, and Mouza. Carefully enter your respective Plot No. and click on the submit button. Now it would display your entire plot information. The Government of West Bengal provides application forms for various job posts on the website. Whenever there is a vacancy in government department it publishes a notice on the website so that the common citizens of West Bengal can apply for the post. You can find the Application forms on the submenu of Citizen Services. 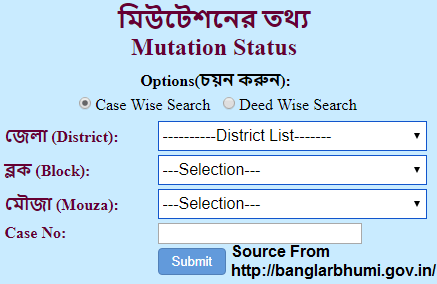 You can also check the Banglarbhumi Mutation Case Status of any mutation case. If you don’t know what is mutation of a property then let me enlighten you. Mutation is the change of ownership when a property is transferred or sold from one person to another. When a property is mutated, then the new owner gets the property changed to his name in the land and revenue department and the government can now charge property tax from the new owner. The process and the fee payable can vary from state to state. When the webpage loads you will get two options to choose from. Banglarbhumi is a famous website mostly used by the people in West Bengal state. It is popularly known for its features of checking and searching information online about Lands and Land Reforms. This site came into existence in 2010 under the government of West Bengal. Banglarbhumi is also available through an online Android application for the state West Bengal. It is specifically designed for examining the status of mutation cases from anywhere and anytime. How to Check Land Classification Information in banglarbhumi.gov.in ? As discussed above how to check mutation status. Similarly visit the official website and then move your cursor to the Citizen Service and under this click on land classification. You will be redirect to the new web page and in the new page you will have to select district from the drop down menu and select your desired district whose Land Classification Information, you want to know. On the home page, click on the mutation case reputation option. A submenu will appear on the citizen services available menu on the home page. Click on the ‘land classification’ option. You will be redirected to a new webpage where you will get a drop-down menu and select your district name of the land classification you want to know. Details will appear on your screen on the code and the classification of land. How to Fill West Bengal Land Conversion Application in banglarbhumi.gov.in ? To fill conversion application, you will have to follow these simple steps as discussed in the following Steps. After the website is completely opened, you are able to see a menu on the upper most of the web page. There is four menu option is shown. These are Online Application, Service Delivery, Citizen Service and Help. From the available options, you will have to move your mouse pointer to the Online Application. There also five option available as shown i.e Mutation Application, Conversion Application, Fees Payment, Application GRN Search and Application/Receipt Reprint. Among the available options under the Online Application, you will have to click on Conversion Application. Now you are able to see in the new page online Conversion Application form. Fill all the detail about yourself and about your plot, such as you name, father name, mobile number, Aadhaar number and add plot details. After that click on submit and you will see you application reference number in the next page. Keep it with you as it is used to view your application status in the future. 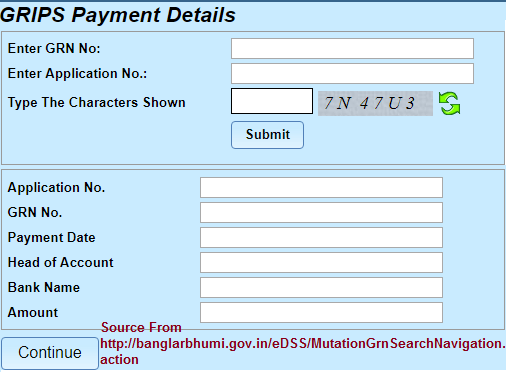 How to Fill Banglarbhumi Mutation Application in banglarbhumi.gov.in ? To apply for the Mutation Application follow the above procedure till the step 5 and then after that follow the Steps as discussed below. Follow the Same process Above upto Step 5 Click on Mutation Application under the sub menu of Online Application. Fill all the details in this page such as applicant name, father name, email id, district, Deed Number, registry Office and fill Buyer detail such as name, father name, caste, gender, tenant type, email id and otp after filling the email id to verify the email id. After that click on submit button and upload your documents in a pdf file which should not be more than 2 mb. After that click on upload and then you will be given a reference number. Note it at some safe place as it is used to view your application status in the future. Caution: If you have multiple documents then you have to scan all documents in one file and then upload it because application only allow one file upload. As discussed above follow the procedure to visit the website and under the sub menu of Online Application click on Fees payment and follow below procedure to submit your fees online. 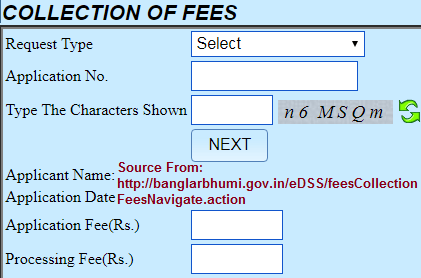 After that you will be redirected to the new page i.e, collection of fees. After that select the request type such as conversion, mutation, etc and then fill application number, captcha shown and click on next. You will be redirected to the fees payment secure gateway. There, select your preferred mode of payment and bank. After you will be redirected to you bank portal. Fill all the details and then and logon to your account and then fill the OTP that is send to your register mobile number and click on submit to submit the fees. About Application GRN Search in banglarbhumi.gov.in ? 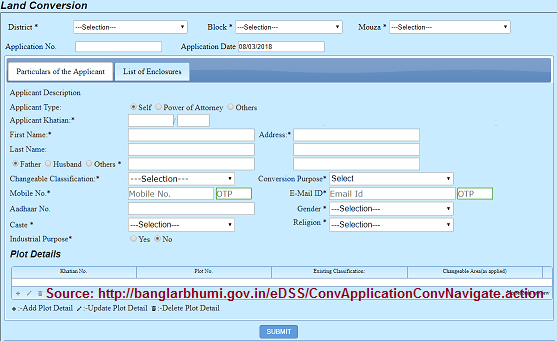 Visit the website banglarbhumi.gov.in as discussed above and then click on Application GRN Search under the sub menu of Online Application. After that in the new page enter GRn No, Application No and fill the captcha. After that click on submit to see all details about your search. To reprint application receipt, visit banglarbhumi.gov.in website and then click on Application/Receipt reprint under the sub menu of Online Application. After that in the new page select request type, fill application number and type captcha text shown. After that click on next and your application receipt is shown in new window, simply click on print and save your application receipt in pdf file. Under the online application sub-menu, click on the application/receipt reprint. You will be redirected to a new page, select the request type, fill in the application number and the captcha code and click on ‘next‘ option. Your application receipt will appear, click on print and save your application receipt in PDF format. Service delivery have 5 options under the menu i.e, ROR Request in which you can calculate ROR Request fees, Plot info. request in which you can calculate Plot info. request fees, Plot map request in which you can calculate Plot map request fees, Request GRN search in which you can search for GRN and in the last Application/Receipt reprint in which you can reprint your application receipt. If you want to follow the case wise search then select the district, block, Mouza, case number and click on submit button. If you want to follow the deed wise search then click on deed wise search and enter the deed no and deed year and click on submit. The result will be displayed which will show the status of the mutation case. The department of land and reforms is one of the important departments of West Bengal. It has to work with businesses and public sector units as well as with the common citizens of the state. The land-related information of 4.30 crores Khatian and 42,042 Mouza’s are stored by the department. Therefore, the Government of West Bengal launched this website so that the people of the state can see the various land-related information in one place. The above-listed services are provided by the banglarbhumi.gov.in or www.wbregistration.gov.in website. If you follow the step by step instructions then you can easily check your Banglarbhumi Khatian & Plot information or Banglarbhumi RS-LR Plot information or any other service provided by the website. The Banglarbhoomi website banglarbhumi.gov.in made easier for the people of the West Bengal to get the information about land reforms. After getting the desired information, you can download or print the details if you want to.